This townhome has just been completely remodeled and is exquisite. The large outdoor deck has also been enlarged. This 2400 sq. ft. townhouse is on the golf course with 3 separate master suites, large deck, and 2 car garage. Great mountain views. Easy access to all activities. On the free bus route. Large flat screen TVs in each bedroom and also in the dining room. Gas BBQ, CD/ipod player, DVD/VCR player, and internet access. Minutes to Sun Valley Lodge and the ski mountains. Cross country ski out your backdoor. Adjoining beautiful townhouse available for family or corporate retreats. Fantastic accommodations for a vacation during all seasons. The 3rd upstairs master suite is very large with sleeping accomodations for 4. The unit is great for 2 families of four. The availability calender is current. Sun Valley is a special place for us. We met here 30 years ago and have been returning ever since. We love all the seasons, but particularly winter and summer. Our kids now share the same love for sun valley and idaho. We are either here in the mountains or in the ocean off san diego. Check out our other vrbo properties on the beach/oceanfront - Seaside, Oregon #175004 and on Mount Hood - Government Camp, Oregon #293311. 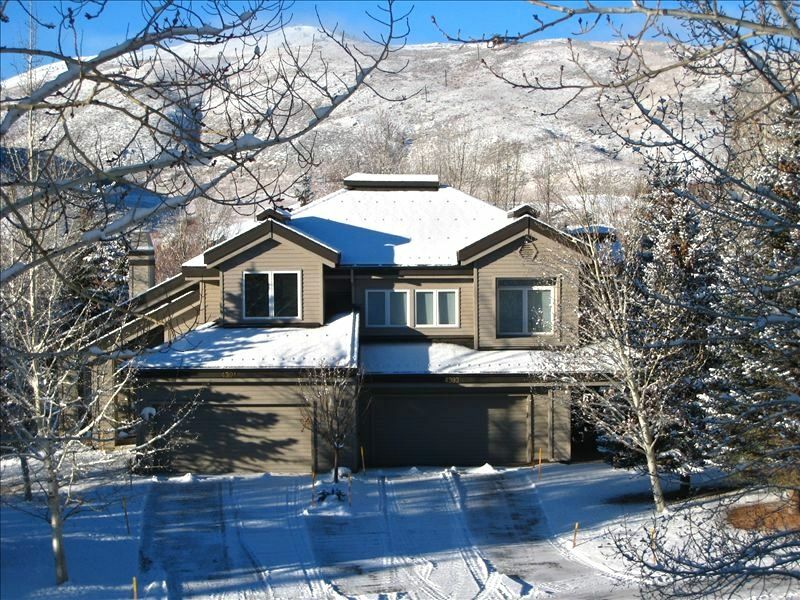 This townhome is unique with all its open space, great mountain views, and ease of access to all the outdoor activities we love to do. We have views of Dollar mountain and Baldy for our living room and deck. We are on the bike path and frre bus route. I can go biking right out our door. We are minutes from skiing and fishing. We have 3 separate master suites, each with a private bath. A very spacious open unit with vaulted big beam ceilings. Great for 2 families of four as well. Sleeps eight easily. A big deck for BBQs. The complex has its own jacuzzi and pool. But we alaso get use of all the elkhorn amenities including year round large outdoor jacuzzi, 2 summer large outdoor pools, and tennis courts. (4) with HBO channels. Large flat screen TVs in each bedroom as well as living room for 4 total. DVD/VCR player with each. Very nice property with excellent location. Clean, with all the necessary features. Had all the amenities of home and was in a great location. Would definitely stay here again. Comfortable townhouses , convenient location and everything we needed was there. This is our 3rd time staying in Elkhorn Village @ Fairway Nine. Our large ski group needs both units side by side and this property fits the bill perfectly. It is half a block to the bus stop so super convenient to transportation. The townhouses are very comfortable, well decorated & furnished and appointed with everything we need to enjoy our stay. We will be back on our next ski vacation to Sun Valley . This is a very nice rental and we enjoyed our five night stay here. We particularly enjoyed the beautiful deck on the golf course and the gas grill. The kitchen was very well stocked with everything we needed to prepare meals. The coffee pot did not work which was a disappointment. We felt the list of cleaning to do upon checkout was excessive in comparison to many other rentals we have stayed at. For example, vacuuming the floors and washing all the sheets. This is a very comfortable home and I would recommend it. A spectacular home in pristine surroundings. We were delighted with this property. The listing accurately described the space but failed to capture its charm! The hospitality provided by the owner was superb and evidenced thru everything from the advance communication to the delivery of a well-maintained property. We would recommend this villa to others. Our activities were centered around easy access to the solar eclipse viewing, to convenient fly fishing and to hiking. We enjoyed the closeness of the running/biking trail and took advantage of it. If available, we would have enjoyed the golf course. We look forward to coming back in both summer and winter months. We stayed in this lovely spacious home last week with two other couples and it could not have worked out more perfect for our ski vacation. It is located within minutes of everything in a very nice part of Elkhorn. The house is beautifully furnished and appointed with everything that you could possibly need. We cooked several meals in as the kitchen was equipped with just everything you would want and more. The three bedrooms all had their own bathrooms en suite which was very nice and private for each couple. They all are "master bedrooms". This home would be great for any couples, family, or single persons getaway. The owner was great to work with and assessable. I highly recommend this home and definitely look forward to going back.